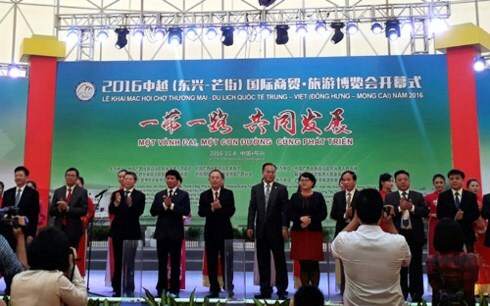 Quang Ninh (VNA) - The 2017 Vietnam-China International Trade Fair will take place in Mong Cai city, Quang Ninh province, northern Vietnam from December 1-7, according to the organisers. The event, the 12th of its kind held on a rotational basis by Quang Ninh and Guangxi of China, is expected to host have 400 pavilions, including 300 of Vietnamese businesses and 100 Chinese ones. It will feature products from Vietnam and China, including agricultural and aquatic products, machines, equipment, electronic appliances, and handicrafts. Tourism, trade and investment promotion workshops will be held to introduce Mong Cai city’s potential to domestic and foreign investors. Exhibitions, art performances, sports exchanges will also take place on the sidelines of the event. Quang Ninh shares a 132.8km land border with Fangcheng district and Dongxing city of China’s Guangxi province. China is currently Vietnam’s top trade partner while Vietnam is China’s biggest partner in ASEAN and the ninth biggest in the world. Vietnam’s statistics showed that bilateral trade reached 71.9 billion USD in 2016, up 7.9 percent over the previous year. The country’s trade deficit with China fell 13.67 percent year on year.